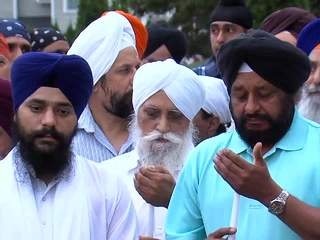 I was having lunch with two other clergy colleagues last Wednesday after which we decided to take a walk over to the Sikh temple in town and express our sympathy and support for them following the shootings that had taken place in suburban Milwaukee on the morning of August 5th. It was a brief visit. We were well received and I sensed our gesture was very much appreciated. The minister gave us each two small books, one which was the first chapter of their Holy book, and the other one which explains their Sikh faith. We were invited back to their worship services at any time. He indicated that it would mean a lot to the worshippers to see us there. We shook hands and left, assuring that we would return soon, most likely not together since we each had different schedules. Saturday night one of my colleagues received a phone call from the missionary at the temple invitin g us to their candlelight vigil that evening. So two of us went and following the worship service, were asked to speak along with other representatives from churches and faith-based organizations. It was a powerfully moving experience for me, especially when the names of the deceased were read and a brief bio of each one was read. I was especially struck by the ages. Most of them were in their 40’s – the prime of life. What had these people done to deserve such a cruel fate? I admit that I knew next to nothing about the Sikh religion before last week. I have learned a lot since then. Saturday evening, I received a first-hand education on how Sikh’s react to violence. Other than the Amish, I know of no other religious community that would respond with anything less than rage. Yet here were these people welcoming us into their setting, their house of worship, explaining to us the essentials of their faith. Instead of ridiculing our ignorance, they were rather apologetic for not having done a better job of educating the American public about just who they are and what they believe. I sometimes write down words because they sound good. In my Sunday sermon, I had borrowed the phrase, “anger has its place, but it also has its limits,” and then developed it further. I obviously had written my comments before my encounter on Saturday night drove that point home ever so forcefully. The tragedy of August 5th begs us as individuals to explore our own feelings – to struggle with our sense of fear and distrust of anyone different from us and to react in a manner that is welcoming, not disruptive, and certainly not violent. No one should be the victim of discrimination, racial profiling, bullying, or shooting simply because they wear a turban or otherwise dresses or looks different. I pray for our society. That this country, which perceives itself to be the greatest in the world, can someday prove that by extending a hand of friendship to those whom we often vilify for no other reason than ignorance. Bias, bigotry and hatred have no place in a civilized society, and certainly not among people who profess love of God and love of neighbor. Abe, thank you so much for extending your hand to our Sihk neighbors. May we all take advantage of EVERY opportunity to open our hearts and minds to others. Imagine what would be if we all did!